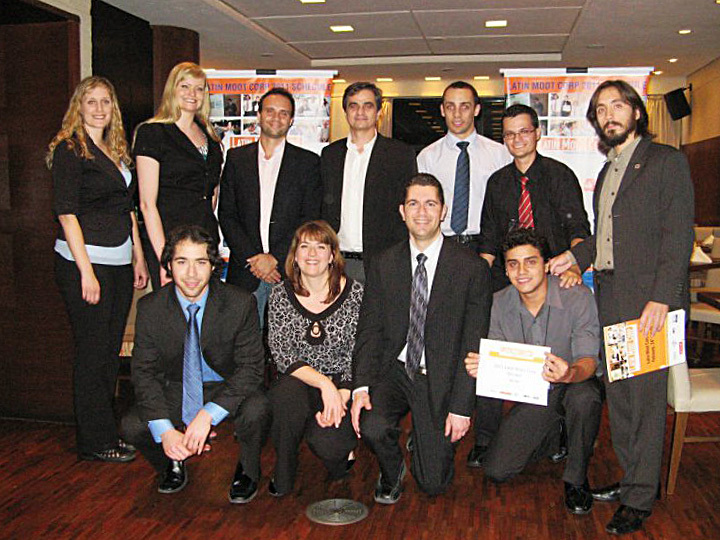 March 16, 2012, Sao Paulo, Brazil— Food Trucks, from Argentina, won the Latin Moot Corp® Investment Competition, the new venture competition hosted annually at Fundação Getulio Vargas. Food Truck, S.A. describes itself as dedicated to bringing a new eating experience to the citizens of big cities, using a network of trucks parked near to areas with a high density of workers and events. As winner of the competition, Food Trucks lands a berth in this year’s Venture Labs Investment Competition (formerly Global Moot Corp Competition) and receives a package from the Centre for Entrepreneurship of FGV, featuring the opportunity for strategic business consulting services and mentoring from a team of industry experts. The Venture Labs Investment Competition will be held in Austin, TX, May 2 – 5. 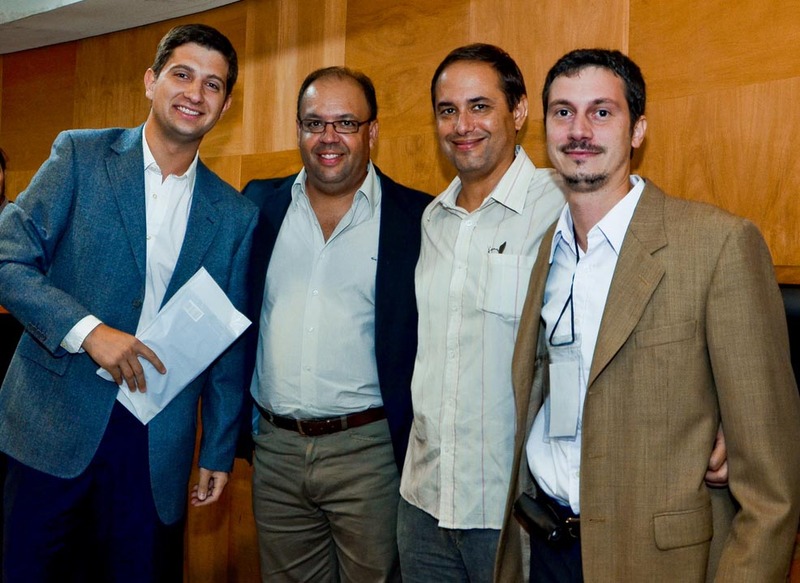 Juan Rodrigues (right), IAE adviser and Franco Ferraro (left), IAE MBA, with Emerson Moraes Vieira and Renato Fonseca de Andrade, from Sebrae-SP. Photo: Carlos Alkmin. The 1st Runner Up was prize was awarded to Bio-Fiend, from Universidade Federal de Minas Gerais. Bio-Fiend’s product is Fragdust, a dust suppressor to prevent or reduce the action of wind in the storage and transportation of iron ore. It utilizes residual glycerine from the biodiesel production process to reduce the dispersion of iron dust in the atmosphere, which causes devastating effects to the environment and health related issues. The best written business plan was awarded to Air Executive Aviation, from Insper and the best presentation was awarded also to Food Trucks. 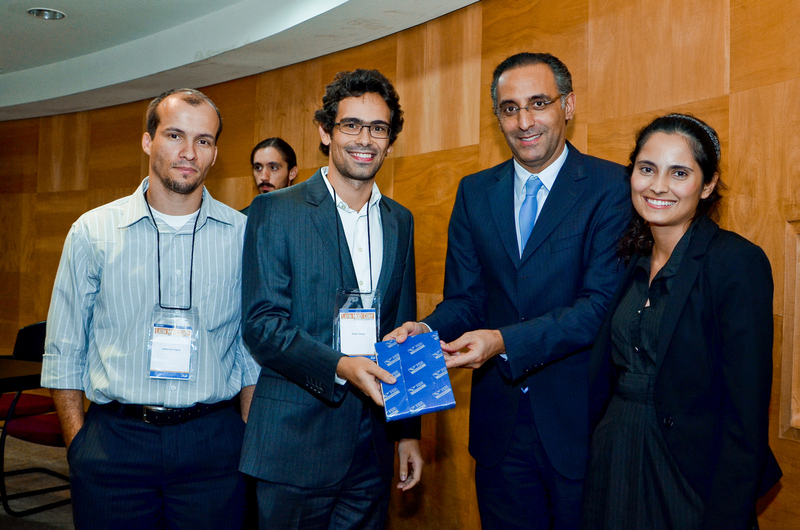 Bio-Fiend team members Jamerson, Pedro and Fernanda being awarded by mayor Eduardo Cury, from Sao Jose dos Campos. Photo: Carlos Alkmin. This year’s judges were a group of experienced VCs, entrepreneurs, executives and consultants, including Rafael Levy, (Allagi), Emerson Duran (Confrapar), Diego Remus (Startupi), Roberta Rossetto (CoWorkers), Thais Filipelli (DGF), Renato Fonseca de Andrade (Sebrae-SP), Carlos Gamboa (Rio Forte), José Eduardo Nalini (IBM), Monique Shohet (Embryon Capital), Patrick Schetchmann (Criatec) and Rodrigo Baer (Warehouse). February 25, 2011, Sao Paolo, Brazil — Janus, a nanoengineering technology company that develops magnetic nanostructures products for various applications, mainly for the efficient separation of water and oil, won the Latin Moot Corp® Investment Competition, the new venture competition hosted annually at Fundação Getulio Vargas. As winner of the competition, Janus lands a berth in this year’s Venture Labs Investment Competition (formerly Global Moot Corp Competition) and receives a package from the Centre for Entrepreneurship of FGV, featuring the opportunity for strategic business consulting services and mentoring from a team of industry experts and access to discounted legal services from top tier providers. The Venture Labs Investment Competition will be held in Austin, TX, May 4 – 7. The 1st Runner Up was prize was awarded to CaIR Technologies Inc. – a diagnostic medical device company set to revolutionize cholesterol testing at the point of care using IR spectroscopy. As Janus was already selected to the Venture Labs Investment Competition by winning the Global I2P in 2010, CaIR Technologies receives it’s berth for the 2011 Venture Labs. The other finalists were BarGain (2nd Runner Up) and Brazil Baby Care E-commerce. The finalists came from a field of twelve teams which competed in the Latin Moot Corp Semifinals on February, 25th in the morning. The top two teams in two divisions proceeded to the Finals. The Latin Moot Corp Competition simulates the process of raising venture capital. It is a unique partnership that brings together students and business leaders. The judges function as an investment group seeking to reach consensus on the business venture they would most likely fund. The judges base their decision on the quality of the idea, the strength of the management team and the clarity and persuasiveness of the written plan and oral presentation. This year’s judges were a group of experienced VCs, entrepreneurs, executives and consultants, including Benedito Fayan (Telefônica), Carlos Alberto Miranda (BR | Opportunities), Daniel Izzo (Vox Capital), Luiz Manetti (Sandvik), Pedro Mello (Grupo Quack), Sergio Luconi Jr (IBM), Ona Kiser (Social Smart), Cristiano Nobrega (Grupo RBS), Michael Nicklas (Social Smart), Rafael Levy, (Allagi), Martino Bagini (Astella Investimentos), Humberto Matsuda (Performa Investimentos), Emerson Duran (Confrapar), Gustavo Caetano, (Sambatech), Harthur Djehdian (Bio for Life), Luigi Giavina (Strula), Luciana Ribeiro (Grupo RBS), Yuri Gitahy (Aceleradora), Diego Remus (Startupi), Roberta Rossetto (H Stern), Patrick Arippol (DGF), André Saito (Allagi), Tiago Cruz (Gina Campos), Renato Fonseca (Sebrae-SP), Ayrton Aguiar (Buscapé) e In Hsieh (BR Innovators). The Latin Moot Corp Investment Competition is hosted by the Centre for Entrepreneurship and New Ventures of Fundação Getulio Vargas. The Latin Moot Corp Competition was the first competition of its kind in Latin America, focused on entrepreneurship and investment.